Pokémon: Let's Go, Pikachu! and Pokémon: Let's Go, Eevee! are on their way for Nintendo Switch. During Nintendo's E3 2018 livestream, Nintendo unveiled some in-game footage showing Pokémon: Let's Go! in action for the first time. The game, which serves as a remake of the original Pokémon Yellow: Special Pikachu Edition, features enhanced 3D graphics for the Switch's hardware capabilities. Players wander around the Kanto region and stumble across wild Pokémon by walking through wild grass, after which they throw Poké Balls at wild Pokémon to capture their opponents, similar to Pokémon Go. One battle against Bug Catcher Rick showed Pikachu fight Caterpie. While players capture wild Pokémon by throwing Poké Balls at their opponents, trainer battle segments play out more like classic Pokémon handheld experiences. Players command their Pokémon on the battlefield, and the two take turns while fighting one another. 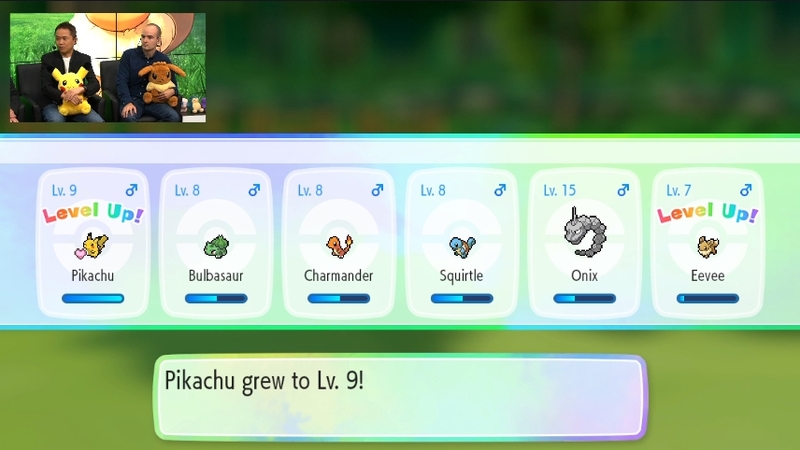 Alongside the player's starter Pokémon, players can also use captured Pokémon to fight trainers' Pokémon. Meanwhile, additional players can join in on the fun by simply shaking their controller. While throwing Poké Balls, players can work together to capture a wild Pokémon by throwing their Poké Balls at the same time for maximum efficiency. Many other mainstays from the original Pokémon games remain. Trainers can visit the Pokémon Center to heal their Pokémon for free, and players can stop into nearby towns and chat with local residents. Trainer battles and other actions can be felt through the Joy-Cons' HD Rumble, and new events and dialogue have been added into the game for players to experience. Gym Leaders return as well, with new design changes to Gyms. In one case, players enter Brock's Gym and approach him to do battle. Brock is the first Gym Leader from the original Game Boy Pokémon iterations Red, Blue, and Yellow, and his reappearance suggests that other classic Gym Leaders will return as well. Pokémon: Let's Go, Pikachu! and Let's Go, Eevee! both release on the Nintendo Switch on Nov. 16, 2018.